A unique all-inclusive Alaska winter tour experience. 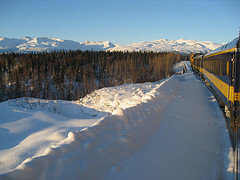 Travel with the famous Alaska Railroad along the magnificent snow covered Alaska Range to Anchorage If you travel during the winter carnival to Fairbanks you may enjoy the World Championship Ice Carving competition and the Open North America Sled Dog Championship. Chena Hot Springs provides some outstanding and almost 100 % guaranteed Northern Lights viewing in a remote wilderness setting just below the Arctic Circle. 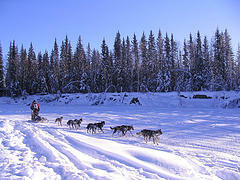 Other winter activities are including: sled dog tours, cross-country skiing, snowmobiling and ice skating. Morning at leisure or for additional individual sightseeing activities around Fairbanks. Early Afternoon: Private van transfer (60 Miles) on the scenic Hot Springs Road with open views across the tundra to the Chena Hot Springs Resort. First opportunities to observe magnificent Aurora displays on the dark northern sky. Overnight: Chena Hot Springs. Breakfast at the hotel. Remaining day at leisure. The Chena Hot Springs Resort provides an indoor thermal-pool with a large redwood outdoor deck, some indoor and outdoor hot tubs, restaurant, bar, the famous ice museum and hotel as well as a large - mineral water feed - natural rock lake. The rooms are featuring the following amenities: full bathroom, two queen beds, TV and coffeemaker. A unique and heated Aurora viewing log cabin for your pure and undisturbed Northern Lights viewing enjoyment is just a short walk away from the resort. Overnight: Chena Hot Springs. Enjoy a delicious breakfast at the resort. The remaining day is at leisure. Spend this day with some exiting adventurous outdoor opportunities. Independent local operators are providing x-country skiing lessons and trips, a variety of guided sled dog tours from 30 minutes to 4 hours, wonderful sleigh rides, snowmobiling tours into the Chena Hills or flightseeing trips above the Arctic Circle with it's remote and authentic native villages (optional). 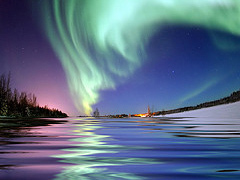 Another evening/night with magnificent and exciting Aurora observation is just ahead of you. The best viewing starts after 10:00 pm and continuous until the early morning hours. Overnight: Chena Hot Springs. Remaining day in Anchorage on your own. Individual tour extensions or sightseeing tours are available. Please contact us for more information. Explore Alaska's largest city by yourself and visit the many points of interests. Take a walk on the Coastal Trail along Cook Inlet to Earthquake Park with a magnificent view of the snow capped Alaska Mountain Range in the distance, or take the motorcoach to Alyeska – Alaska's largest Ski Resort. Whatever you do don't miss a delicious lunch at one of Anchorage's top seafood restaurants. During February and March Anchorage hosts the annual Fur Rendezvous, Ice Carving Festivals, the Iditarod Sled Dog Race and other super natural Winter events. Flight reservations to your home destination may be made anytime for today. Please Note: all flights to/from or within Alaska are not included. End of the tour package.